Stocks continued to go down last week, bringing every major market to the levels not seen since a beginning of December. After years of no significant pullback, the indexes finally dropped more than 5% last week, while pumping more fuel to a volatility’s engine. The “fear index” VIX has broken its downward trend line already a week before and continued to rise to the levels last seen more than 2 years ago. Those day traders who enjoy trading both ways will definitely welcome these “long time no see” fluctuations. While people look for the most truthful reason behind the decline, the real mean might be just the simple rationale of saying “enough is enough”. It all might just have started with the wage growth rate that was quite surprising and surprises in the market are followed by sudden actions by humans. Then bond yields increases and inflationary fears were the main highlights in the news, who are responsible for bringing information to the public. This is their job, the press and media are responsible for arranging such message to waste public. So even though the weight of the reason behind might be small in real terms, in reality, it might be overdone. Of course, the inflation hurts the stock market from macroeconomic perspective however in these levels it is still safe for a bull market to continue its path. Whenever there is a market correction it is always being connected to the recent political or economic events to explain the increases/decreases of the particular underlying securities. The real reason is that market had enough of all the positivism that was wrapping around the price since a long time ago and this is just a healthy correction. Well, and 5% is not that tragical anyway, I wouldn’t be surprised if more drops are coming. It is important to watch the support levels and keep the big picture of the trend. A bull market growth is built on strong economic fundamentals. We have GDP growth, we have low unemployment, etc… Thus, there is no fear of bear market at the moment. The market will go now to a consolidation and thus, it is important to wait for a panic to calm and then it will be rather an opportunity to enter new positions, rebalance and possibly diversify. In the face of the index was riding a super crazy rollercoaster last week, the price significantly rebounded from the 200 periods moving average, which is the long-term support level watched by the entire world. Dow is looking for its correction territory, at the moment around 100 MA, although a further drop down to 200 MA is not ruled out yet. 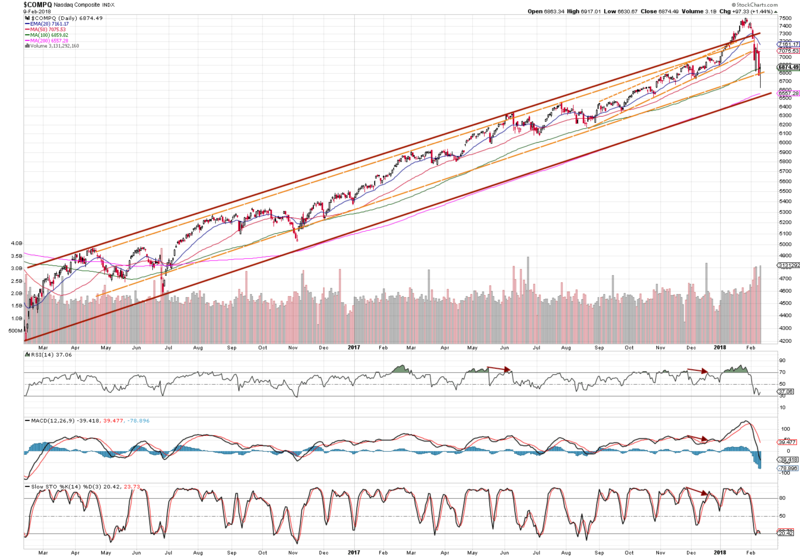 The index’ decrease stopped at the lower inner trend line (orange dashed line) and is forming its consolidation around 100 MA. The UK’s Financial Times Index has broken down from the sustained trend channel (red wide lines) landing on the 100 MA too. 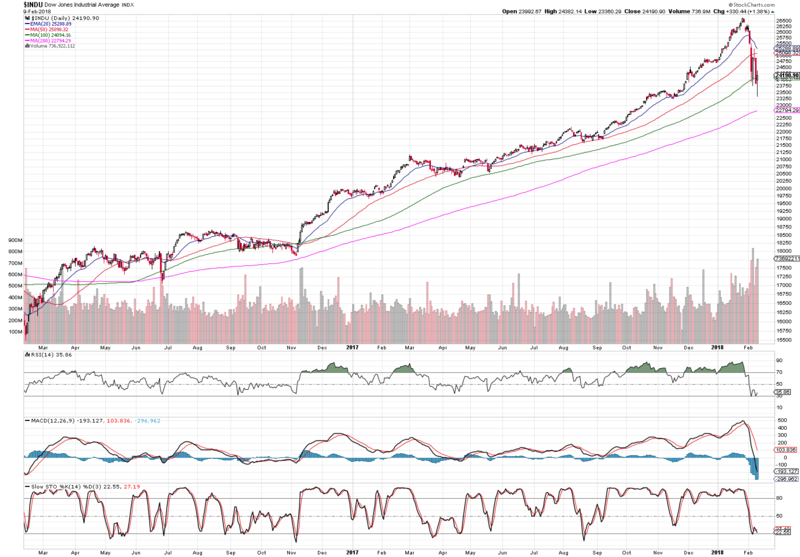 As the charts show, most of the indexes are trying to form a consolidation zone at the 100-period simple moving average, however, this is just a beginning while more declines may be coming. 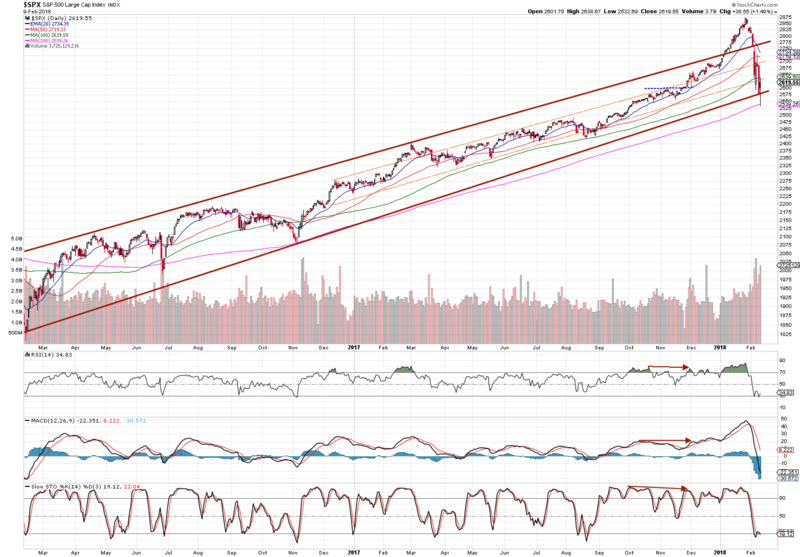 The market will need several more trading days/weeks until another bull run will begin.